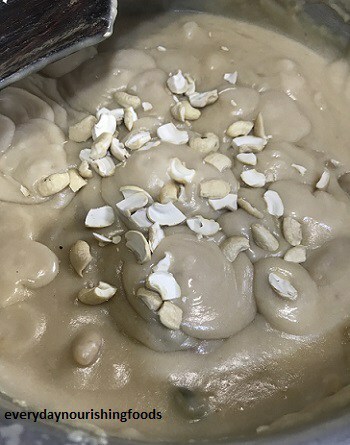 Thalikala paasham is Telangana’s traditional sweet dish made on Vinayaka Chathurthi. Generally, we make this only once in a year, on this festival as an offering to Lord Ganesha. Thalikalu is the Telugu word for noodles. 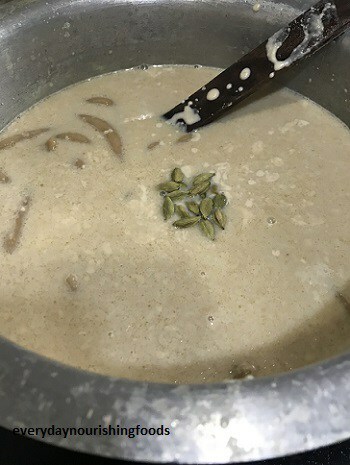 Paasham means payasam or kheer. 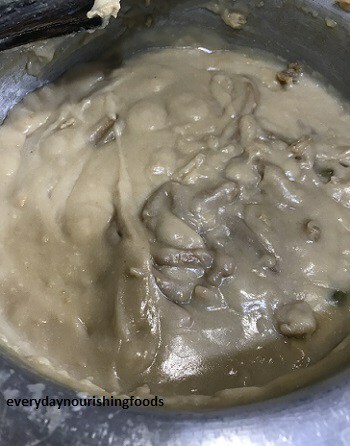 Handmade noodles will be cooked in milk and thickened with rice flour and khus khus paste. We made this in full fat cow milk, you can use buffalo milk as well. 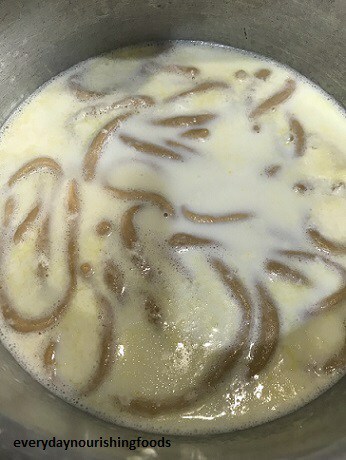 Some people also do thalikala payasam by cooking thalikalu in jaggery solution. Take whole wheat flour and make a soft dough using water. 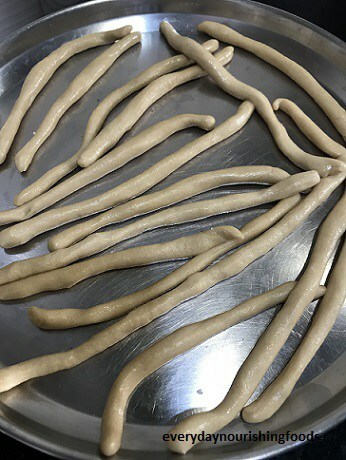 The dough should be like paratha dough so that we can make long noodles with it. Grease the dough with little ghee and let it rest for 30 min. Take a big vessel and add milk to it. Let it boil on slow flame. Meanwhile, take the dough and roll into 1/4-inch thick noodles. You can grease the hands with ghee and roll the dough into noodles on your palm itself. 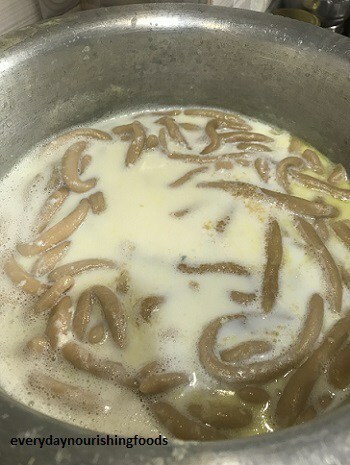 When milk starts boiling, add these noodles and let them cook till done. Now add sugar and let it boil for 5 more minutes. Noodles will take around 30 minutes to cook. Meanwhile, roast poppy seeds. Take roasted poppy seeds, rice flour and little water or milk in a grinder and make it into a thick smooth paste. To this paste, add more milk and make the paste into pouring consistency. Now add this poppy seeds mixture into boiling milk and mix it thoroughly. Add the whole cardamom and let the mixture boil on a slow flame for around 20 min. In between, mix the mixture and scrape the sides and bottom. Add broken cashews and let it cook for 20 more minutes on slow flame. 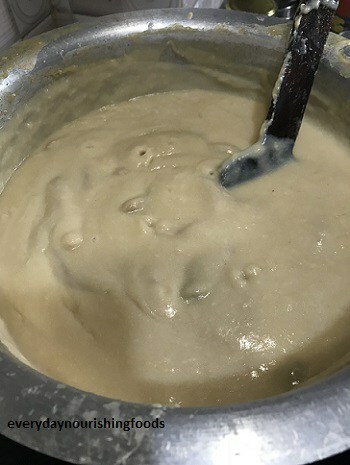 The mixture should become quiet think. Now the dish is ready to serve! Take a big vessel and add milk to it. Let it boil on slow flame. Meanwhile, take the dough and roll into 1/4-inch thick noodles. 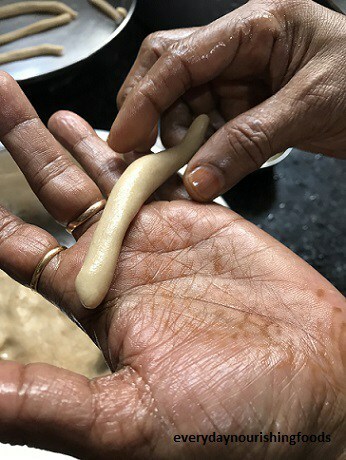 You can grease the hands with ghee and roll the dough into noodles on your palm itself. Meanwhile, roast poppy seeds. Take roasted poppy seeds, rice flour and little water or milk in a grinder and make it into a thick smooth paste. To this paste, add more milk and make the paste into pouring consistency. 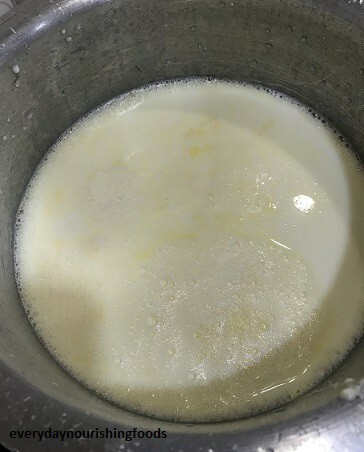 Add this poppy seeds mixture into boiling milk and mix it thoroughly. Add the whole cardamom and let the mixture boil on a slow flame for around 20 min. In between, mix the mixture and scrape the sides and bottom. Add broken cashews and let it cook for 20 more minutes on slow flame. 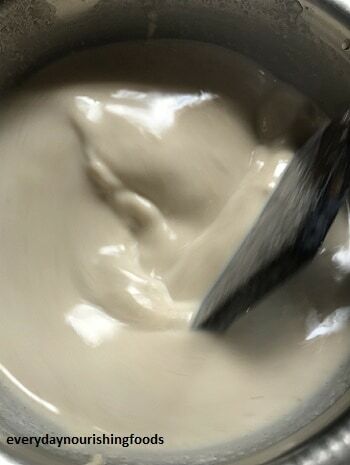 The mixture should become quiet think. You can see the change in color of the dish in the following 2 pictures. Now the dish is ready to serve! Do try and please leave your feedback here 🙂 Happy cooking ! !